Kids love scooters! In addition to giving them the freedom to cruise around and have fun, scooters are also a great way to build your toddler’s confidence and develop their motor skills, balance and coordination. After extensive research, we’ve put together our list of the best scooters for toddlers. You can be sure that every scooter on our list is safe, durable, fun to ride, and gives you good value for your money. Scooters are a very popular gift for any occasion and if you’re looking to buy that special toddler in your life a scooter, we’ve got you covered. The Vokul Mini Kick Scooter is a great beginning scooter for your toddler that will provide them with hours of indoor and outdoor fun! This awesome scooter comes in navy blue, green, and pink and has a 3-wheel design, with two wheels in front and one in the rear. The brakes are on the rear wheel. The wheels are anti-abrasive and shock absorbing, and designed to help the scooter glide smoothly. A cool feature that kids love is the rims that light up when the scooter is in motion. Other great features include an adjustable T-bar and a lean to steer mechanism. The reinforced deck is made from super wide ABS plastic to provide your child with more stability and safety. Plus it ensures room for both feet to comfortably fit on the scooter. This T-bar on this Vokul scooter is adjustable from between 26 inches to 31.2 inches and it’s low to ground, making it easy for toddlers to get on and off by themselves. Capable of holding kids weighing 71 pounds or less, this mini kick scooter is made with parts that are easily replaced when needed. If you’re looking for a fun, safe way for your toddler to cruise around, this scooter is definitely worth checking out! 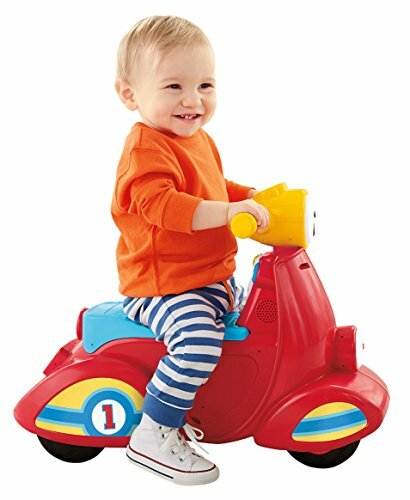 Ride on toys are great fun for toddlers and the Fisher-Price Laugh & Learn Smart Stages Scooter is no exception! This brightly colored ride-on scooter is designed to provide hours of fun and learning for your child. It features 50 plus learning songs and 3 different shape buttons that teach colors, shapes and opposites. In addition to that, there’s also a motion switch that activates learning content while your child rides. Plus it even has a honking horn, which kids absolutely love! As with all Smart Stages toys, there are 3 different age appropriate learning levels to meet your child’s growing skills. The first level is explore, which introduces sing-along songs, phrases, and more. The second level helps your child to identify different shapes and colors. The third level is designed to encourage your child to engage in pretend play and use their imagination. You change the levels of learning simply by sliding a switch to the level of learning most suitable for your child’s age and learning ability. This awesome ride on scooter is a three-wheel design with 2 front wheels and one back wheel. It takes 2 AA batteries (included) and operates by your child pushing with their feet. The Fisher Price Laugh and Learn Scooter offers your toddler a lot of entertain value and it’s a great way for them to have fun while they get some exercise! The Micro Mini Deluxe Kick Scooter is an awesome little scooter designed specifically for toddlers. The T-bar adjusts from 17 inches up to 25 inches, so your child will be able to ride this scooter for a couple of years, at least. It has a 3 wheel design, with two wheels in the front and one in the rear. It features a non-slip injection deck and it’s a lean to steer scooter, which means it uses your child’s weight when steering. The T-bar is removable for transport, making this scooter easy to take to anywhere, including the park, camping, or to the grandparents house. At just 4 pounds it’s lightweight and easy for kids to move around. Recommended for kids from about age 2 to 7 years old, it comes in a variety of different colors including blue, green, pink, purple, and red. The Micro Mini Deluxe Kick Scooter is a great beginning scooter for young toddlers and an excellent value for parents. Toddlers think it’s tons of fun to ride! If your daughter is a My Little Pony fan, she’ll be thrilled with the adorable My Little Pony Dynacraft 3-wheel scooter! This fun scooter has a pink, blue, and white color combination and features “Come flu with me!” graphics on the handlebar and kickboard. It also has a headlight that actually lights up. In addition to the sturdy 3-wheel design, other safety features include an extra wide kickboard to help keep the scooter upright and an easy-to-stop rear footbrake. There are 4 buttons your toddler can push to hear phrases by different My Little Pony voices, and she’ll love the light and the fact that one of the sounds is actually horse hooves. It requires 2 AA batteries (included), and aAlthough it’s recommended for kids between the ages of 3 and 7 years, some parents said that their 2 year old was able to use this scooter with no problem. 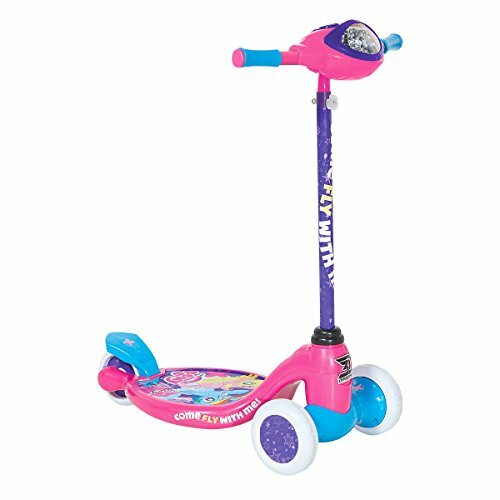 Any My Little Pony fan will love this scooter and have hours of fun on it! Kids love the fun graphics and sounds! The Mini Kick Scooter With LED Light Up Wheels by Rimable is a fun scooter that’s perfect for toddlers! This scooter features a stable 3-wheel design with 2 larger wheels in the front and a smaller back at the wheel with a step on brake. 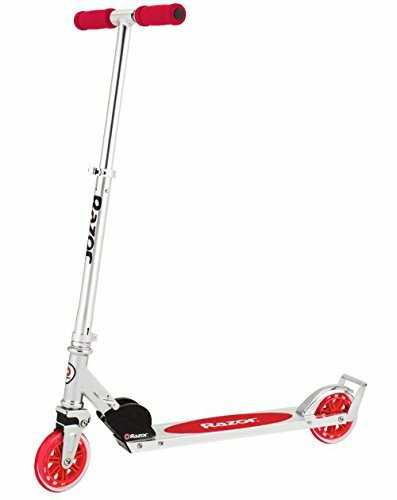 The T-bar adjusts easily and extends up to about 33 inches, so your child can ride this scooter for a number of years. A lean to steer feature adds to the safety and the sturdy, low to the ground deck is easy for toddlers to get on and off of by themselves. The handlebars are cushy and comfortable to hold onto, making this mini kick scooter great for longer rides. The wheels are made from soft polyurethane and provide a quiet, smooth ride. They also won’t mark your floor, which makes this scooter ideal for indoor and outdoor use. But the thing kids love the most about this awesome scooter is that all 3 wheels light up! Assembly is a breeze and this scooter is great for kids as young as two or as old as 8 or 9, depending on their size and weight. Parents like that this scooter will grow with their child, lasting them for several years and making this toy one that gives them a great deal of value for their money. Kids love the light up wheels! The LIYU 1281F 3-Wheel Kids Mini Kick Scooter is a great mini scooter for young toddlers. This scooter comes in your choice of black, blue, green or pink and features a three wheel design with two larger wheels at the front of the scooter and a smaller wheel at the rear. 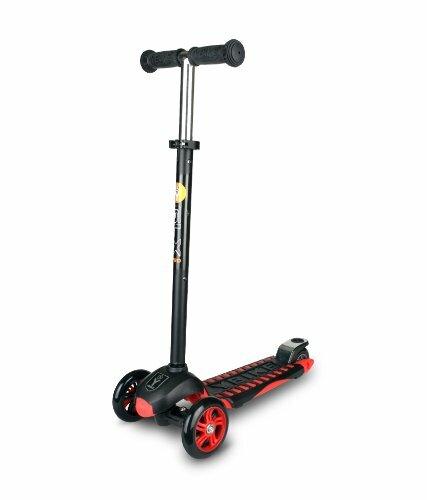 The mini scooter has an adjustable T-bar and a wide base as well as lean-to-steer turning and LED flashing wheels which your child will enjoy. The wheels are anti-abrasive and made from shock absorbing polyurethane and the mini kick scooter has a wide rear deck made of strong ABS plastic for extra stability. Its low to the ground design makes this scooter easy for toddlers to get on and off. It also has rear wheel breaking and soft rubber handle grips suitable for small hands. The scooter will accommodate children weighing up to 77 pounds and is recommended for toddlers ages 2 to 5 years, and this seems to be quite accurate. We recommend that children use protective gear such as a helmet and elbow and knee pads when riding this scooter. This LIYU 1281F 3 Wheel mini scooter is a good choice for any active toddler who likes to be on the go constantly. 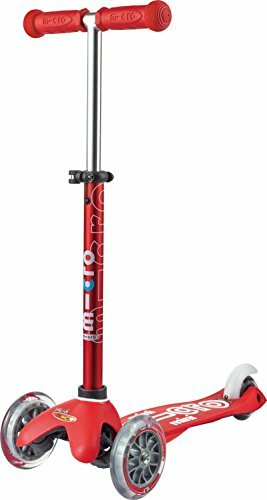 Made of sturdy aircraft grade alumium, the Razor A3 Kick Scooter comes in red, green, blue and black which are all great colors that toddlers love! This two wheel scooter has 125mm incline style urethane wheels and a rear fender brake, plus a wheelie bar design. The kick scooter is made for children age 5 years and up but several parents found it suitable for toddlers as young as 3. It will grow with your child as the Razor scooter will bear weight for anyone weighing 143 pounds or less. The height bar is also adjustable to up to 34.5 inches, making it the ideal scooter for children to use for several years. 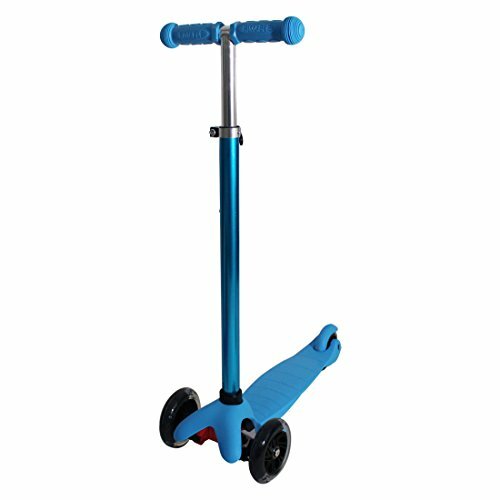 This scooter has been used by kids in both high school and college as well as those in pre-school so it’s quite versatile and popular. The larger wheels on the A3 helps this it glide smoothly on rough payment, making it ideal to ride just about anywhere. Unlike lean to turn scooters, the front T-bar steers the front wheel as you ride. This scooter is perfect for learning to perform tricks. It also folds for easier transport. While the Razor A3 scooter may not be for very small toddlers, it seems to work fine for children ages 3 or 4 and above. Seems to be great fun for kids of all ages and even some adults! Encourages toddlers to go outside, play and exercise while having wonderful fun! This Kuokel Folding Kick Scooter for Kids is designed for children ages 2 through 12, comes in your choice of black or white and will grow with your toddler. The handlebars adjust from 24.8 inches to 32 inches and can bear weights up to 132 pounds and offers a four wheel design with the two back wheels closer together. 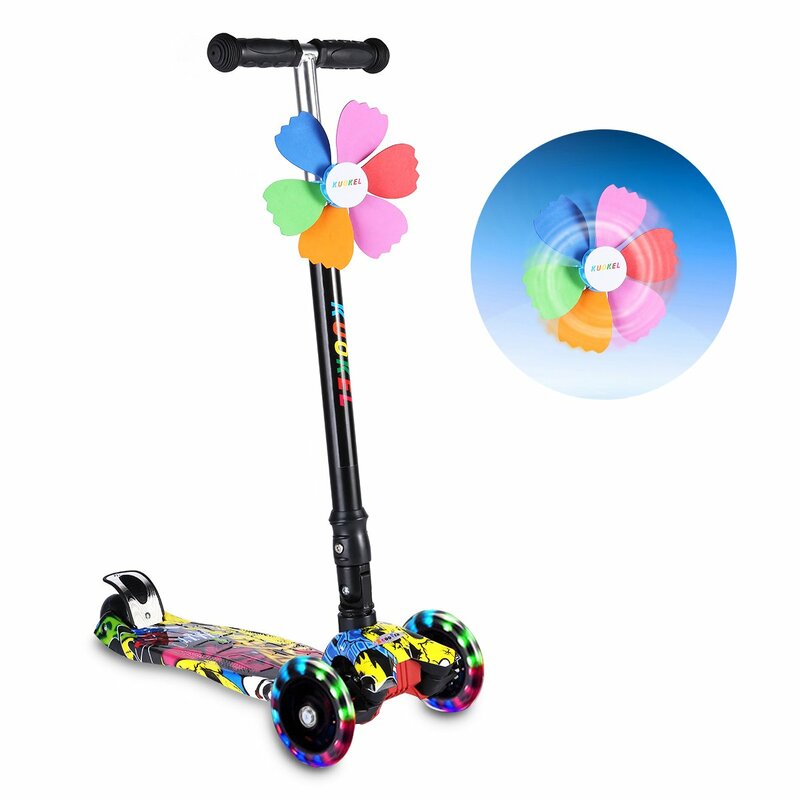 This scooter has a 120 degree lean to steer mechanism and colorful LEDPU wheels that shoot off bright colors as the wheels turn which your child will love! This Kuokel Kick Scooter has a foldable design making it easy to transport and has a reinforced chassis and beams. It comes equipped with a good rear brake and has a windmill on the front, which adds more fun for small children. 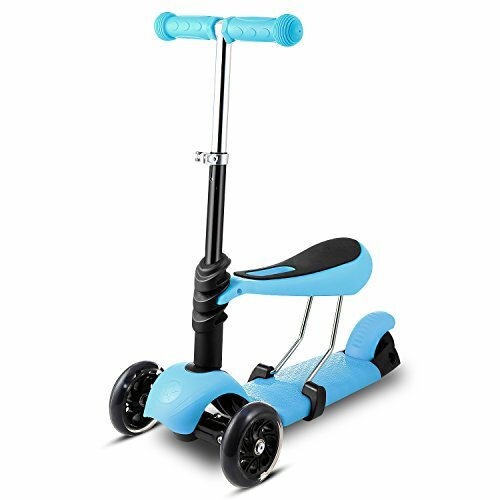 The bright colors on the deck of this scooter will make your child stand out in crowd, and is as suitable for a 10 or 12 year old as it is for a 2 or 3 year old toddler. The wheels on this scooter will allow your child to go as fast as they would like. The Kuokel Foldable Kick Scooter is a great scooter for anyone wanting a scooter that will grow with your child. The Ybike Pro Scooter comes in your choice of three distinct colors Black/Red, Black/Purple, or White/Black, so suitable for all toddlers. It has a three wheel design and a lean to steer mechanism with handlebars that adjust in height from 28 inches to 32.5 inches. This beautiful scooter has large 125mm front wheels for smooth riding and a fiber reinforced ABS wide deck and lighted wheels with a rear braking system. The Ybike Scooter measures 28.4” X 11.4” X 36” and will bear weight up to 110 pounds. It is recommended for children ages 5 and up, but some parents have purchased this scooter for children as young as 2 and they seem to be able to handle it just fine. While the Ybike Pro Scooter can’t be folded for transport, the handlebar can easily be removed to make transporting this scooter easy. Parents like that it’s reasonably priced and will grow with their toddler, making it a great value in today’s economy. Depending on your child’s rate of growth, this scooter may well last them into their pre-school years. We do recommend that you purchase protective gear for your child to go with this scooter. The Ybike may be a good choice for any parent looking for a dependable scooter that will grow with your child. With 11 great colors to choose from, the Globber Primo 3 Wheel Adjustable Height Scooter is sure to come in a color your child will adore. However, there is more to this scooter than just a great color scheme as it has several features which are perfect for toddlers on the go. For starters, this scooter has a secure lock button that keeps it moving in a straight line while your child develops their coordination, kicking, and then their balance. Then you can unlock the lock so your child learns how to lean to steer this scooter. The front pivot supports make for smoother turning for your child, while the adjustable height of the handlebar adjusts from 26.5 inches to 31 inches. There is also a steel plate reinforced deck, high rebound PU wheels with ABEC 5 bearings and an extra long rear break for easier stopping. The handle of this scooter detachesm making it more compact for traveling. 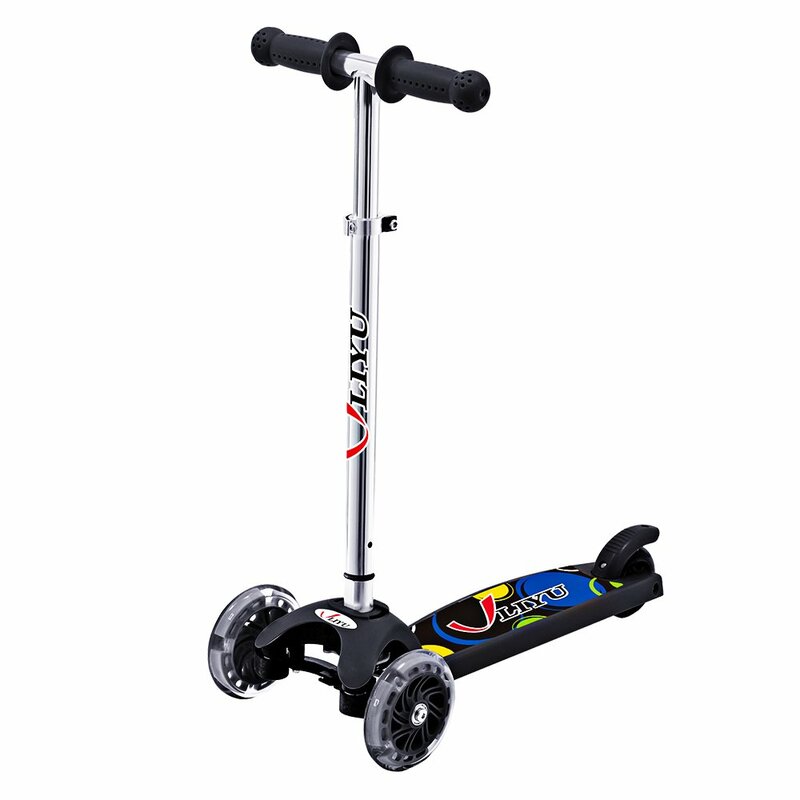 This scooter is suitable for children ages 2 to 6 and for those riders under 110 pounds weight capacity. It is advisable that you also purchase protective gear for your child to use when riding this scooter. The Globber Primo 3 Wheel adjustable height scooter is the ideal scooter for toddlers who are just beginning to learn to ride. Fun for beginning riders to master the skills of riding a scooter! Perfect toy for independent play! If you’re looking for a fun scooter that will grow with your toddler then the WeSkate Kids Kick Scooter may be the one for you! This scooter can be used both as a ride on scooter or a kick scooter since it comes with a removable seat. It also has really cool LED flashing lights on all three wheels, which kids really love. Other great features include a lean to steer mechanism and extra wide brand an extra wide rear brake. These features plus the extra stability provided by 3 wheels ensure that this scooter is really safe for your toddler. Both the handlebars and seats are adjustable to accommodate different ages and sizes of toddlers and preschoolers. The handlebars adjust to three different heights and it has a maximum weight capacity of 110 lbs, making this WeSkate scooter one that will grow with your child. Although this scooter is designed for children ages 2 through 6, several parents said the seat makes it great for kids as young as one. 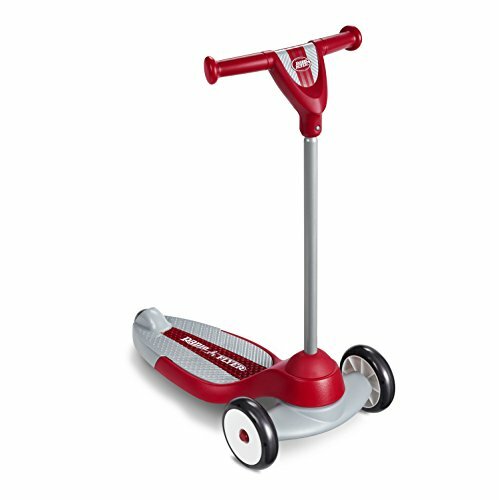 This scooter is sure to provide years of fun for your little one and help them to feel independent while providing them with healthy exercise. Radio Flyer have made fun toys for children for generations, so it should come as no surprise that Radio Flyer has a beginning scooter for toddlers called My First Scooter. This toddler scooter is designed to develop balance and coordination in young children. 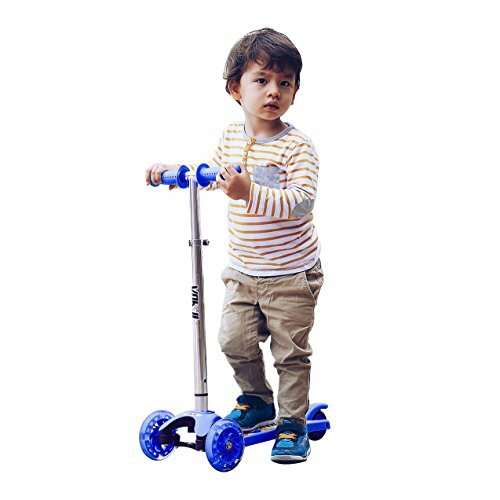 It features an extra wide textured deck, a 3 wheel design which makes for a more stable scooter and also has comfortable hand grips for little hands. The low to the ground design, combined with the plastic wheels and the 50 pound maximum weight limit, make it the ideal starter scooter for young toddlers. The handlebars do not adjust and stand about 26 or 27 inches high, but they do come off, making this scooter easier to travel with. Although the handlebars control the turning, the steering is rather stiff since it is designed for first time users, and small children tend to over steer. While this scooter is recommended for children ages 2 to 5, most parents find it works best for children 3 to 4 since the handlebar height is not adjustable. We do recommend that you purchase a helmet, knee and elbow pads with the scooter to provide extra protection for your child. The Radio Flyer My First Scooter is a great scooter for toddlers, from a brand parents have come to trust. Learning to master and ride this scooter is fun for toddlers who love being on the go! 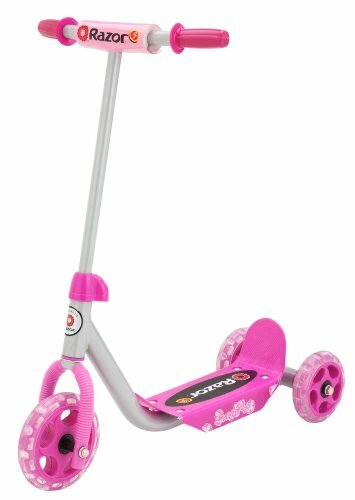 The Razor company is known for an assortment of ride on toys especially scooters, and the Razor Junior Kiddie Kick Scooter is designed specifically for toddlers and pre-schoolers. It comes in your choice of blue or pink and features a three wheel design with one wheel in the front and 2 in the back. It is constructed from steel, aluminum, and plastic and has a folding mechanism for convenient storage and travel. The deck is wide slip resistant polypropylene and it has urethane wheels and easy to grasp soft foam handles. The handlebars are not adjustable and you steer by using the handles. 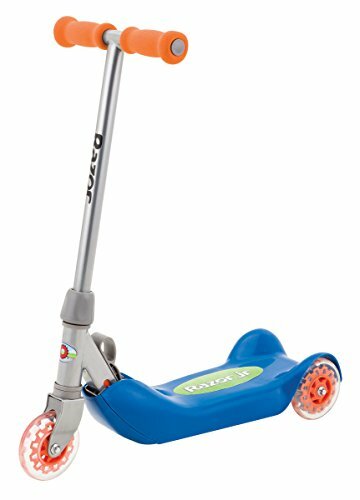 This Razor Junior scooter is recommended for children age 3 years and up, but many parents purchased this scooter for 2 year olds and shared that it works fine for that age. It seems to accommodate most children up to the age of 5 as long as they weigh 45 pounds or less. This kick scooter is specially designed to be a child’s first scooter, so it is designed not to go overly fast and doesn’t have a brake so your young toddler or pre-schooler can simply stop the scooter by putting their foot down. It is recommended that this scooter be used on smooth pavement and parental supervision is advised. It is also advisable that you purchase protective gear including a helmet, elbow and knee pads to protect your toddler from those occasional spills. If you are looking for a scooter that is specifically designed for young children, then the Razor Junior Folding Kiddie Kick Scooter may be worth considering. Will give your child their first taste of independence while providing them with hours of fun play! 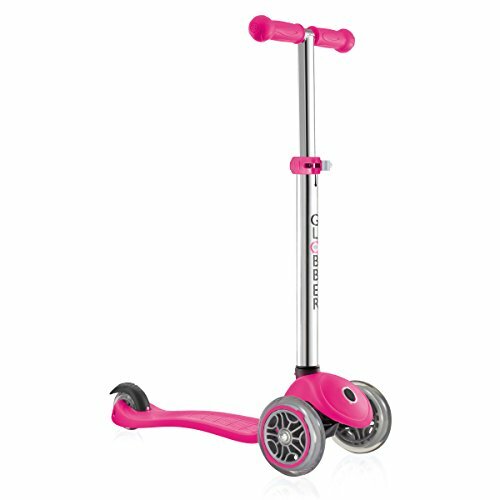 The Razor Jr. Lil’ Kick Scooter comes in your choice of blue or pink and has a three wheel design, 1 in front and 2 in back. Featuring a wide slip resistant deck, padded T bar and welded steel frame, it’s perfect for young toddlers as a starter scooter. The extra large wheels are larger than the wheels on normal Razor scooters, is height adjustable and steers using the handle. This scooter is designed for children age 3 years and up or until around the age 5, but several parents shared that this scooter works well for their 2 year old. It is suitable for children weighing less that 45 pounds. It is recommended that parents supervise their child when they are riding this scooter and make sure that they ride it only on smoothly paved surfaces. We would also recommended that you provide your child with a helmet, elbow and knee pads for protection when riding this or any other scooter. The Razor Jr. Lil’ Kick Scooter may be the ideal scooter for toddlers and pre-schoolers who are active and on the go.